The birth of Chateau Lanessan dates all the way back to 1793 when it was founded by Jean Delbos. Initially the vineyard and estate was much smaller, as the property started out with 24 hectares. The impressive, classic chateau, with its Tudor, inspired influences was constructed in 1878. Eight generations later, Chateau Lanessan remains in the hands of the Bouteiller family, which are direct descendants of the founder. This is quite a feat for a Chateau located in the Medoc, as most vineyards have changed hands several times. Aside from their obvious passion for wine, equestrian activities have always been a part of the makeup for Chateau Lanessan. They have numerous stables, which were constructed at the same time as the chateau in the shape of a horseshoe. As horses and carriages played an important part in the history of Lanessan, the estate also maintains a museum devoted to historical carriages. Chateau Lanessan has remained popular with wine lovers for their traditionally styled wine, which has always sold for a very consumer friendly price. In an effort to increase quality, starting with the 2015 vintage, the owners of Lanessan brought in Hubert de Bouard, the owner of Chateau Angelus as their consultant. The 80 hectare vineyard of Chateau Lanessan is planted to 60% Cabernet Sauvignon, 35% Merlot, 4% Petit Verdot and 1% Cabernet Franc. OUt of its 80 hectares, 45 hectares are cultivated with vines. The vineyard is close to the St. Julien appellation. In fact, it’s just a bit south, as you drive up the D2, the Route de Medoc. The terroir is mostly gravel based soils. On average, the vines are 30 years of age. The vineyard is planted to a vine density of 10,000 vines per hectare. As we mentioned close to half of the land owned here is not used for vines. Instead it’s reserved for natural forests, greenery, parkland and horse riding trails. While there are 45 hectares planted to grapevines, the remainder of the property features 20 hectares of parkland. Here you also find beautifully manicured gardens and even a large space for growing vegetables. To produce of the wine of Chateau Lanessan, vinification takes place in traditional, concrete vats. Malolactic fermentation takes place in vat. The wine is aged in a combination of 33% new, French barrels, 33% one year old, French oak barrels and 33% two year old, French oak barrels for an average of 12 months. The production of Chateau Lanessan is large, making the wine quite easy to find in the marketplace. On average close to 18,000 cases of wine per vintage are produced of Chateau Lanessan. There is a second wine, Les Caleches de Lanessan which made its debut in 1999. 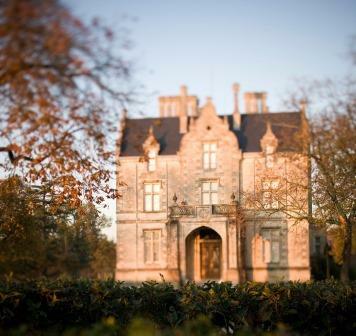 They also own Chateau de Sainte Gemme, an estate that is also situated in the Haut Medoc appellation. Chateau Lanessan remains a popular Left Bank wine with consumers, due to its traditional, Bordeaux styled wine, low price and ability to age for decades. Chateau Lanessan needs some time before it can be enjoyed. Young vintages can be decanted for an average of 90 minutes to 2 hours. This allows the wine to soften and open its perfume. Older vintages might need very little decanting, just enough to remove the sediment. Chateau Lanessan is usually better with at least 7-8 years of bottle age. Of course that can vary slightly, depending on the vintage character. Chateau Lanessan offers its best drinking and should reach peak maturity between 7-20 years of age after the vintage. Chateau Lanessan is best served at 15.5 degrees Celsius, 60 degrees Fahrenheit. The cool, almost cellar temperature gives the wine more freshness and lift. The wine of Chateau Lanessan is best served with all types of classic meat dishes, veal, pork, beef, lamb, duck, game, roast chicken, roasted, braised and grilled dishes. Chateau Lanessan is a perfect match with Asian dishes, hearty fish courses like tuna, mushrooms and pasta as well as cheese. Sharp red fruits with espresso and tobacco nuances bring you to a piquant layer of cassis with soft, gentle tannins and a medium-bodied finish. The wine was made from 52% Cabernet Sauvignon, 38% Merlot and 10% Petit Verdot. Made from a blend of 50% Cabernet Sauvignon, 35% Merlot, 10% Petit Verdot and 5% Cabernet Franc, this medium/full-bodied wine is full of luscious fruits with silky tannins, juicy cassis, plums and tobacco. The wine has richness, length and sweet fruits that make it the best vintage of Lanessan I have ever tasted. Medium bodied, bright, crisp, fresh, with a focus on its red fruit character, spice and earth notes. This should drink well early. Bright rustic, austere and on the lean, crisp, cherry side, the nose, with its earthy, tobacco and cassis leaning, was much better than the palate. Rustic tannins, dark cherries, herbs and cassis are found in this medium bodied, classic styled wine. Sporting a new label, that will probably have older fans up in arms, this lightly colored, medium bodied wine offers earth, red/black fruit and cedar wood aromas, ending with a tangy, sharp, dark berry finish. Firm, bright, crisp and tannic, this is not much fun to drink today. Perhaps time will soften the strict tannins and add more to the very, fresh fruit and tobacco character. With a blackberry, herb and green leafy scented perfume, this young, wine is rustic and angular in nature. Cassis, tobacco, ash, blackberry and wet earth aromas are easy to locate. Medium/full bodied with some rustic tannin remaining, this represents good value from the Medoc for fans of traditional Bordeaux wine. Medium bodied, rustic, more on the spicy, peppery, red fruit side of the style range, with green herbs and some dryness in the finish. Tobacco, old wood, cassis, green herbs, medium bodied with a rustic hard texture that ends with tart cherry and cranberry. I suspect this will age and continue to evolve in the same direction.